The prospect of designer babies has been a staple of the dystopian futures imagined by science-fiction writers, evoking fears of eugenics (e.g. Brave New World) or social inequality (e.g. Gattaca). However, new advances in gene editing technologies, in particular, the discovery of the CRISPR-Cas9 system, are bringing this piece of science fiction closer to reality. Last week, researchers published the first study demonstrating gene editing in human embryos. More studies are likely to come as universities and companies around the world pursue the same goal for a variety of scientific and clinical applications. Despite calls from some in the scientific community to place a moratorium on gene editing in embryos, such a moratorium would be difficult to enforce worldwide. What are the capabilities of this new technology and what might it hold for our future? In this Insight, I will address these questions by discussing the science behind gene editing, its limitations, and the future of gene editing in the clinic. The principle behind targeted gene editing is fairly straightforward. If you create a double-stranded break in DNA, this break can be repaired in one of two ways (see the diagram below). One way, called nonhomologous end-joining, involves stitching the two broken pieces of DNA together, often creating a mutation at the site where the DNAs are rejoined. Therefore, if you make a cut inside a protein-coding DNA sequence, more often than not, you’ll introduce a mutation that will knock-out the function of that gene. The second way in which the cell can repair a double-stranded break is a process called homology-directed repair. Here, the repair machinery makes use of the fact that we carry two copies of our genome, one which we inherit from our father and one which we inherit from our mother. The machinery searches out the matching DNA sequence on the undamaged copy of the chromosome (the homologous chromosome), then copies that sequence onto the damaged chromosome. For genome engineering purposes, we can trick the cell by adding in a foreign DNA molecule that looks similar to the region that we cut. Instead of grabbing the homologous chromosome, the repair machinery will grab the foreign DNA and copy that (along with whichever transgenic sequences we want to add into the genome) onto the damaged chromosome. So all you need to do to edit a gene, is find a way to cut the genome at a specific sequence, and the cell’s DNA repair machinery will take care of the rest for you. If the principle behind gene editing is so simple, why wasn’t it done earlier? The bottleneck in the process has been finding a general method to cut the DNA at a specified sequence. Early efforts in this area involved engineering proteins to recognize specific DNA sequences, but this process turned out to be fairly difficult, often requiring a few rounds of testing and redesign to get a protein that targets the right sequence. Thus, anytime you wanted to target a new DNA sequence you’d have to begin a laborious effort to design a new protein. The discovery of the CRISPR-Cas9 system changed all of that. This system, which comes from the antiviral defense mechanisms used by bacteria, consists of two parts: the Cas9 protein which houses the enzyme active site that cuts the DNA, and a guide RNA (in bacteria, this RNA comes from a region of the genome containing clustered regularly interspaced short palindromic repeats, hence the acronym CRISPR). The guide RNA contains a 20 bp guide sequence that tells Cas9 which sequence to cut. Because the guide sequence works through simple Watson-Crick base pairing, designing a new cutting enzyme is simple and requires changing only the 20 bp guide sequence (as well as making sure that the target sequence contains a small sequence motif recognized by the Cas9 protein). 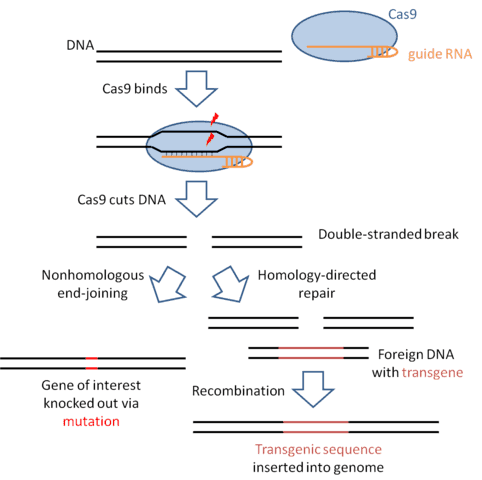 The ease with which Cas9 can be targeted to any arbitrary sequence makes CRISPR-mediated gene editing available to anyone with reasonable training in molecular biology. So now that we can edit the human genome at will, super-intelligent babies must be just around the corner, right? Unfortunately, the genetics of many traits that we care about are quite complex and difficult to manipulate. Take the genetics of human height, for example. We know from previous studies that genetics explains ~ 80% of the variation in height among individuals, with environmental effects (differing diets, etc.) accounting for the other 20%. Furthermore, researchers have identified many of the genes responsible for determining an individual’s height. The problem, however, is that each of these genes individually has a tiny effect on height. For example it takes the combined effect of ~700 genetic variants to account for ~20% of the variation in human height. So unless you’re editing hundreds to thousands of genes at a time, you’ll only minutely affect the chance of your baby being tall. This is likely true for other complex traits, like intelligence. This discussion, of course, presupposes that we understand which changes we’d like to make to the genome. The studies above that identified the thousands of genes that influence human height were found in so called genome-wide association studies (GWAS). The key word here is association: these studies identified genetic variants associated with human height, but the studies cannot determine whether the variants are causing the differences in human height. Many of these variants probably do not influence human height themselves, but instead co-segregate with a nearby variant that influences human height. Unfortunately, knowing how to edit genomes does not mean we know what to edit. Of course, there are examples of traits whose genetics is much simpler. Many genetic disorders, such as sickle-cell anemia, cystic fibrosis, and Huntington’s disease, are caused by well-characterized changes to a single gene that we know to be causative of these disorders. Gene editing offers the prospect of repairing the mutations that cause these single-gene disorders. While research is moving forward to use CRISPR to treat individuals with genetic disorders, gene editing is not required if the goal is to engineer embryos free from genetic disorders. In most cases, doctors can instead sequence the DNA from embryos in order to determine which embryos would have a genetic disorder and which would produce healthy children. The doctors can then use only the healthy embryos for in vitro fertilization. Sequencing and screening embryos, called preimplantation genetic diagnosis, is a much easier, safer and cheaper method than using gene editing to achieve the same goal. Are there any useful applications of gene editing in embryos? It turns out that there are a few rare cases of beneficial traits conferred largely by a single gene. For example, researchers have identified individuals who lack functional copies of the gene PCSK9, a gene involved in cholesterol metabolism, who are perfectly normal except that they have unusually low amounts of bad cholesterol, suggesting that they are at lower risk for cardiovascular disease. Individuals who carry mutations in the CCR5 protein, one of the co-receptors for HIV, are immune to HIV infection. A particular mutation in the APP protein, the protein that forms plaques in the brains of those with Alzheimer’s disease, lowers one’s risk of Alzheimer’s disease. Gene editing offers the ability to introduce these rare mutations into embryos to lower their lifetime risk of cardiovascular disease or Alzheimer’s or confer resistance to HIV infection. Of course, the standard of safety for these types of modifications is much higher than in therapeutic applications: For therapies that intend to fix a genetic disorder, side effects from the procedure are tolerable as long as they are not worse than the disease they’re curing. For therapies intended to treat asymptomatic individuals, even mild side effects can skew the cost-benefit ratio. So far, the list of such beneficial traits is small, but as full genome sequencing becomes more commonplace, perhaps we will identify more beneficial single-gene traits. Ultimately, it is our ability to finds such traits that will limit the possibilities of gene editing to create genetically-enhanced humans. Are we headed for a brave new world? So, what does this new technology mean for the future of medicine? CRISPR will continue to be an important tool for biomedical research, allowing researchers to more easily generate new cell lines or animal models to study human disease. For use in the clinic, either for gene therapy in individuals with genetic disorders or for the modification of embryos, CRISPR and other gene-editing technologies still face many challenges regarding their safety and efficacy. For example, CRISPR cuts fairly efficiently at its target sequence, but it can also cut at “off-target” sites, introducing unwanted mutations elsewhere in the genome. Figuring out how to reduce off-target effects is a must before CRISPR enters the clinic. Even if these issues are resolved, however, we lack the necessary information to know a priori the effects of most genetic changes we introduce, so research must proceed with caution. Without more fundamental breakthroughs in our understanding of biology, we have only a limited capacity to genetically enhance embryos, so CRISPR will not lead to a Gattaca-like world with a genetically-engineered upper class, ruling over a non-engineered lower class anytime soon. Hopefully, CRISPR will instead find its first clinical uses in therapeutic applications like helping those with genetic diseases or engineering immune cells to help fight HIV or cancer. Regaldo 2015. Engineering the Perfect Baby. MIT Technology Review Magazine. My areas of expertise include RNA biology, single molecule spectroscopy, biochemistry, and evolutionary biology. I’m sure they are just scratching the surface. Are we still in the information age or what? I think you are right on track for a “eugenics age” going straight to the genes? You could fix the gene for vitamin c and end scurvy forever. Not that scurvy is much of a problem in the modern age. Since the bait was sort of “should we fear our coming ability to control our world at an entirely new level” :nb)… I’ll kick it off with, you bet! Not too much in the article convinces one (if fearful) that all the crazy things imagined in the movies couldn’t or won’t happen. The breakthrough seem to declare with seamless authority, it is now truly, more realistically possible. Good for us! It’s still exactly what we should be trying to do, what we have always done, and what we will always do, or die tryin. What we also have, must and will do, is struggle mightily to bring the good parts of our humanity along with us. To keep making the novel human choice with what we discover we can do. 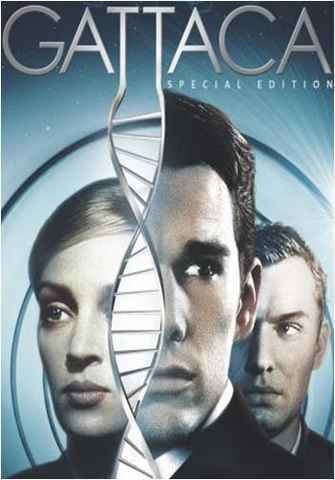 What made Gattaca such a compelling story to me (a favorite) is that is one [I]story[/I] of how that might really happen. Moon is another one. Both are nail biter’s. Cancer’s day’s numbered? Not quite. CRISPR-Cas9 was just tried in human embryos and it had horrendous off target effects (surprise surprise). There are also other techniques that exist like TALENs and ZFNs which supposedly have lower off target effects (which come at the cost of lower efficiency), but get far less press. Don’t forget, siRNAs got tons of hype when they first came out too and were supposed to revolutionize medicine and our treatments of disease. Well, we’re still waiting for the revolution over a decade later, and many pharma companies have completely abandoned siRNAs due to their intractability for now. We really shouldn’t? Let’s see! As anything else in science, this is a tool, as much as applications are concerned, and we know that tools can be used for good or for bad! That depends on the hands holding the tool. Now its said that this tool is not ready yet because of some problems but scientists will solve these problems. The may not make it limitless, but they will push the limits away. And that makes such tools really powerful and experience teaches us that, unfortunately, its more probable for such powerful tools to be in the wrong hands. There are always people who want to get bad things out of such tools and, unfortunately, there are always scientists who are willing to serve those people. Of course its ridiculous to say CRISPR or its innovators are the ones to be blamed. Its like blaming Einstein for the atomic bomb because without ## E=mc^2 ##, such a weapon couldn’t be built! But then, who should be blame? What can we do? The situation is like this. We have people who know how to pick a lock. Some of them use this skill to help people who are locked out. Some others use it to break into people’s house. You can’t blame the innovator of lock picking. The problem is with the ones who hire lock pickers for breaking into people’s house and also with the lock pickers who accept to do it. But the present situation is just a bit bigger. The tool is more powerful and so the people who hire its experts are more important people and the bad things that can come out of it has broader scope, wider range and deeper impact. It seems to me we can do nothing about this situation. I was going to say we need to care about science ethics but it doesn’t seem to work. In fact when I think about this world and the way some people think, it seems inevitable to me that there will be some really bad consequences of this. Don’t take me wrong. I too like to see science going forward. But my problem is, there is something as necessary as science that is being overlooked in today’s world. So what do I think? We should fear CRISPR and that’s the only thing we can do about it. In fact I should say we should fear all sciences, because without the necessary thing I mentioned, all of it is a tool in the wrong hands and as sciences moves forward, those wrong hands can do more damage to humanity. [QUOTE=”gravenewworld, post: 5091886, member: 10355″]Cancer’s day’s numbered? Not quite. CRISPR-Cas9 was just tried in human embryos and it had horrendous off target effects (surprise surprise). To be fair, the Liang et al paper did not use [URL=’http://www.sciencedirect.com/science/article/pii/S0092867413010155′]newer CRISPR methods[/URL] that can reduce off-target effects by 50-1000 fold. We’re not yet at the point where off-target effects are not a concern, but there is clearly room for improvement. Yes, TALENs and ZFNs will probably still have uses (for example, some of the clinical trials to edit T-cell to be resistant to HIV are being done with ZFNs). A good way forward may to use CRISPR for the initial research (because it’s easier to test different targets with CRISPR), and once a good target has been identified and validated, to design TALENs or ZFNs. Of course, there are other problems such as the difficulties in cloning TALENs or the fact that the TALEN genes are quite large and difficult to package into some viral delivery vectors (like adeno-associated viruses). I’d agree with the comparison to siRNAs, in that it will be difficult to perform gene editing [I]in vivo[/I]. For many of the same reasons why siRNA has failed to take off as a therapy, gene editing in live humans may not ever become a worthwhile pursuit. [I]Ex vivo[/I] gene editing to engineer immune cells or correct genetic disorders in blood cells, however, certainly seems to be a very feasible goal in the near future. Most of us alive today wouldn’t exist without science. Should we all fear the thing that feeds and cloths us? Maybe, but I think it’s important to put that fear in perspective. A far great horror would be a world without science. It’s important to consider the benefits along with the costs. In that light the question we should be asking ourselves in regard to genetic manipulation of humans is will the benefits outweigh the costs. I never said we should abandon science. But we should fear its bad consequences the same as when we fear an airplane crash. We don’t abandon airplanes, we just try to prevent crashes and still prepare for them in lots and lots of ways. I’m just saying the “airplane” of science and its “passengers” aren’t ready for the possible “crash” and haven’t been preventing it either. I also should mention that we had several of such crashes before. Where science worked as a weapon in the wrong hands. I’m not mentioning any specific event because I don’t mean to say there is one or even several countries who should be blamed. Its something related to all of us, as humans. This is really annoying. You do something like this, which at first glance appears to flout the policy agreements in place to not edit the human germline. You get people worked up, the researchers put something in like “it caused unintended mutations in the embryos”, and it sounds even worse. Of course it caused unintended mutations – the technology is only 2 years old. Clinical trials for HIV are presumably the ex-vivo method of generating the CCR5delta32 cells? Much less risky than in vivo editing. I just wrote a risk assessment on CRISPR-Cas9 for therapeutic use; the tech is evolving quickly, risks of off-target effects are being mitigated every day by improvements such as tru-gRNAs, dimeric hybrid Cas9-FokI Nucleases, etc. but no way would I consider it safe to use for human therapeutics at the moment. We’ve only just had the postulation of possible methods for detecting genome wide off-target effects in the last few months – at the first instance we need to be able to detect all off-target effects, then they can be used to develop rules for enhanced target specificity. The initial computer programs (MIT, etc.) most researchers have used thus far to generate gRNAs were pretty much rendered obsolete by the new genome-wide off-target detection methods because of their inability to accurately predict off-target binding sites. It is possible to design DNA sequences and make those physical DNA molecules. For example, scientists at the J. Craig Venter Institute synthesized a complete bacterial genome in 2010 and used that to create a [url=http://www2.technologyreview.com/article/423691/synthetic-cells/]synthetic cell[/url]. They currently use similar technologies to synthesize viruses for vaccine production. Instead of having virus samples sent to their lab, they can just get the virus’s DNA sequence in an email and synthesize the virus themselves. Similar work has been done to [url=http://www.nature.com/news/first-synthetic-yeast-chromosome-revealed-1.14941]synthesize yeast chromosomes[/url]. Although we are working towards having the technology to build new genomes from scratch, we lack a lot of the knowledge required to build new functions into genomes. It’s as if we have a printing press, but no one knows how to read. Roughly, what is the strategy? Oh, wait, I see you’ve linked an article [URL]http://www.nejm.org/doi/full/10.1056/NEJMoa1300662#t=article[/URL] in the blog post. OK, I read the article quickly. It seems they take out some of the immune cells of the patient which are usually infected by HIV, make the immune cells resistant to HIV infection, then put the cells back in the patient. Here they do it just once. In the full treatment, presumably they will have to do it multiple times, since I assume the body will generate more immune cells that are not resistant, while those that were made resistant will die off over time? Is Zero a Natural Number? How Well Do You Know Albert Einstein?